CLICK THAT IMAGE TO THE LEFT TO SEE IT BIG! DO IT! 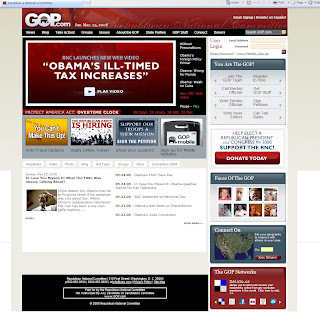 Barry Obama's name is on that front page of the GOP's website TEN FRIGGIN' TIMES! TEN! Please try to find the actual GOP's candidate's name on that front page. It is not there. John McCain's name is nowhere on the front page of the website. Not in one place. The huge red box with the "play" symbol is nothing but different images of Barry Obama. Link HERE. You know the reason that the Republicans swept the Congress in 1994 was because they had ideas that were sound and their policy was clearly and plainly expressed. Even though they failed to follow through with it, it was still sound policy. Now, the Republican Party is the "Anti-Obama" party. Not one single idea or policy is shown on this page, they are simply bad mouthing an idiot. For the love of G_d man! Barry Obama is an idiot. The fact that the Republicans are advertising FOR him on the site is idiotic as well. What in the Hell happened to the Republicans? Do they want to be as stupid as Democrats? What the Hell? Mike Duncan, Jo Ann Davidson, Frank Donatelli, and Carly Fiorina are seriously too stupid to be allowed to continue living in this country. They give a bad name to retarded, friggin' morons. I gotta go eat some Valium. The republicans have no ideas. There a joke...gay marriage, liberal media, etc...always on the defensive. Now is the time to be bold, and what do we get..Obama is commie who is going to raise your taxes. Well what is your alternative programs or ideas?? Lets see: Defund the department of education; no they couldn't do that. Defund the department of commerce; no they couldn't do that either. Defund the department of energy; no not that. Nothing, and these jokers are "conservatives" what exactly are they trying to conserve?? An empire running on fumes. The republicans are finished (heard about that democrat upset in Mississippi), their base is demoralized...and I can't blame them, what do republicans offer?? NOTHING!!! The federal government has grown very large under W. Lower taxes, how about eliminate taxes...like capital gains and on dividends, don't lower them eliminate them. This is how they play games, time to get bold because people are tired of the BS talk, time to do something...but they won't. Just give up and join the coming democratic majority. In a way I support high taxes, atleast people will stop being wasteful with their money because they won't have much to waste. Remember during the 1950's the highest tax bracket was 90%....during a republican administration too. With the money CEOs make for screwing up, I think I wouldn't mind 90% marginal tax rates. CEOs sign contracts that guarantee their pay no matter what happens, is this how the free market works??? This is the BS that is causing people to lose faith in the "free market." The economic elite jokers better wake up before people stop respecting their wealth. First, I have already debunked that about First District in Mississippi, that seat has always been Democrat EXCEPT for the twelve years that Wicker held it. He was the exception, not the rule. And to bolster the point, the reason Bush won so heavily in that district is because the Democrats have been lurching Left for so long that no one with any brain votes for them. That area was mostly rural for years, so I must point out that farmers are usually pretty wise in the ways of the world. The Republicans caved to the hype by the Mainstream Media despite anything else that can be said, they just want people to like them. The Democrats don't care about that, their voter base will always be resupplied, there's one born every minute, remember? That is my point, the future democratic ranks are growing (born every minute, thanks to birthright citizenship). The democratic ranks are not being resupplied, they are growing. Is the republican base growing, hell no it is not. We are headed for a permanent democratic super majority, it is time for republicans to be bold while they can. NOW is the time, while we still have a conservative majority, however tenuous it has become. If certain measures are not put into the constitution, it is over..the time to act is right now. It is time for the republicans to do a Boise State..hook and lateral, not just the typical hail mary. But to be honest I can go either way, far left or far right...I guess you can say I am a Richard Nixon type of republican(people may not remember but Nixon instituted some what would be considered left wing policies during his administration). I just don't want to be with a bunch of losers, if you don't know how to win let alone compete then you are a loser (why join someone who either doesn't or forgot how to put up a fight). The conservative movement is dying a very slow death, or what ever is left of it. Yeah I know what your thinking, I can become a libertarian. Well guess what, you'll just isolate yourself further..I mean if people stop voting for republicans why the hell would they start voting for libertarians?? They wouldn't. You should read Eric Hoffer's "True Believer"...a successful movement can only occur when that movement has the ability to absorb all kinds of people and ideas. And right now the democrats are that party, they actually have two wings (conservative via your rural friend(and Zell Miller) and libs like Nancy Pelosi). Quick name me a prominent liberal republican (one that is pro gay marriage)?? Zell Miller spoke at the Republican Convention and he wasn't thrown out of the party....the democrats are becoming what Eric Hoffer describes as a successful mass movement. Just drink the Kool Aid and join the democratic conservative wing of the party because there is no longer any real kind of alternative or effective resistance. Did you ever notice how when people become rich they tend to become left wing, why is that? Not all of course, but I am beginning to see a statistical pattern (I'll admit, it is superficial). All the energy is with the Democrats now...man the republicans had it all and squandered it, there only and last hope. After about 2020, the permanent democratic super majority will be in place.